Clinicians are often unaware of the detailed steps of the credentialing process and are too embarrassed to ask. 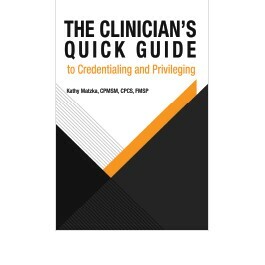 Now they have a go-to guide for credentialing, privileging, applying for medical licensure, verifications, and other sometimes-confusing topics. This handbook is a quick reference guide for residents, new practitioners, and even seasoned physicians as they go through the credentialing/appointment process with hospitals and health plans. For each topic covered, the guide provides brief, easy-to-understand information to help clinicians understand the process and what is required before applying for a new clinical position. Kathy Matzka, CPMSM, CPCS, is a speaker, consultant, and writer with 30 years of experience in credentialing, privileging, and medical staff services. She worked for 13 years as a hospital medical staff coordinator before venturing out on her own as a consultant, writer, and speaker. She holds certification from the National Association Medical Staff Services (NAMSS) in both medical staff management and provider credentialing. She is one of the first recipients of the NAMSS Fellow designation. Matzka has authored a number of books related to medical staff services, including Medical Staff Standards Crosswalk: A Quick Reference Guide to The Joint Commission, CMS, HFAP, and DNV Standards; Chapter Leader’s Guide to the Medical Staff: Practical Insight on Joint Commission Standards; The Compliance Guide to The Joint Commission Medical Staff Standards; and The Medical Staff Meeting Companion: Tools and Techniques for Effective Presentations. For the past eight years, she has been the contributing editor for The Credentials Verification Desk Reference and its companion website, The Credentialing and Privileging Desktop Reference. She is co-author of HCPro’s Verify and Comply, Sixth Edition. Matzka has performed extensive work with NAMSS’ education committee developing and editing educational materials related to the field, including CPCS and CPMSM Certification Exam Preparatory Courses, and CPMSM and CPCS Professional Development Workshops. She also serves as an instructor for NAMSS.